With every new Meryl Streep movie, I wonder what the most amazing actress of our generation will come up with next. So, there is great excitement with each new movie, wondering what character Meryl will bring to life. “Ricki and the Flash” looked like it would be great fun. Meryl Streep as a 60-year-old rocker! Unfortunately, “Ricki” is not much fun at all. 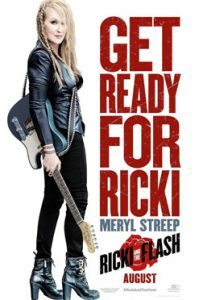 Indeed, Meryl rocks away, playing electric guitar as Ricki (born Linda) who plays with her band The Flash, with 80s rocker Rick Springfield as Greg, who also sings and plays guitar. Ricki works at a high-end grocery store during the day, and plays with her band at a Southern California bar at night. She lives in a small, dingy motel room. A few minutes into the movie, Ricki receives a phone call from her ex-husband Pete (Kevin Kline), a wealthy financial type from Indianapolis. He tells Ricki that their daughter Julie’s (Mamie Gummer, Streep’s real life daughter) husband has just left her, and Julie has moved back to her father’s house. Julie is in bad shape and Pete asks Ricki to come back to see her. Reluctantly Ricki agrees. It’s a difficult homecoming for all. Ricki has not been back to Indiana in decades. She has only sporadically kept in touch with Julie and her two brothers since she left to pursue her rock music dreams. No one is happy to see Ricki. Ricki’s wild hair and outfits elicit stares and stifled laughs wherever she goes in Pete’s upscale, conservative world. For a movie with so much talent involved, “Ricki and The Flash” is a disappointment. Oscar-winning director Jonathan Demme (“Silence of the Lambs”) and screenwriter Diablo Cody (“Juno”) have filled the movie with clichés. Indianapolis is full of uptight, judgmental folks who are appalled by Ricki. Cody’s dialogue lacks any humor or subtlety. If it wasn’t for a few nods to the contemporary world (Pete’s new wife, Maureen, played by Audra McDonald, is black, and one of their sons is gay), this movie could have been from the 1950s. After an uncomfortable amount of time spent in the Midwest, Maureen tells Ricki it would be best for everyone if she returned to California. Ricki rejoins The Flash and becomes romantically involved with Greg. I have to give the filmmakers credit for showing lovers in their 60s! It’s only at this point that the movie picks up any real energy. Streep really loves to rock and roll! After a while, Ricki receives an invitation to her son’s wedding back in Indianapolis, and has to decide whether to go or not. Do they really want her to come, or were they just being polite by inviting her? Will she embarrass herself and the family if she shows up at the wedding? Can she afford the trip? There’s good chemistry between Streep and Springfield. Indeed, they are the only ones who seem to be having a good time; everyone else is too busy being uptight. With one exception, even the scenes between mother/daughter Meryl and Mamie don’t come across well. And while it’s fun for a while to see Meryl once again play a totally different character, I doubt that she will receive another Oscar nomination as Ricki. The movie just doesn’t have enough going for it to be remembered at Oscar time. I’m happy Meryl continues making movies at an age when she could comfortably retire. I hope that before long we’ll be able to forget “Ricki” and look forward to another Meryl Streep movie!